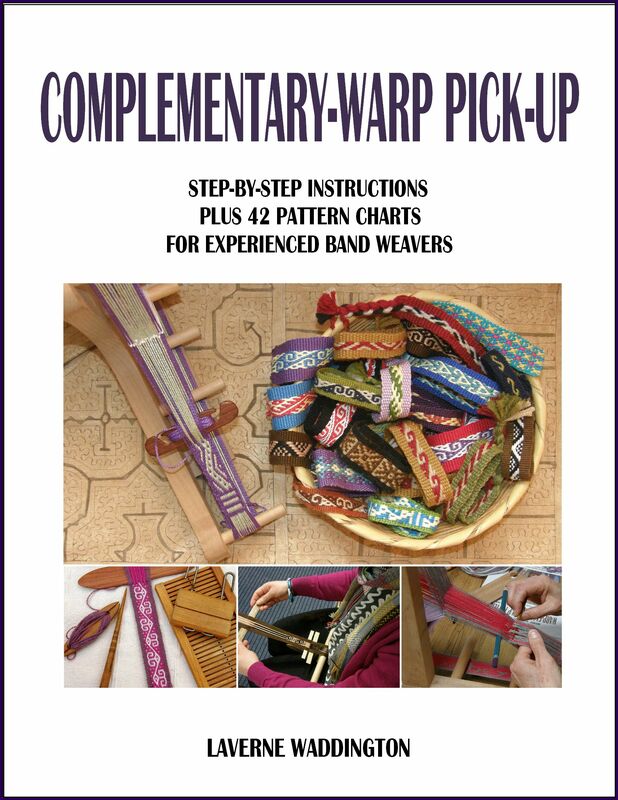 I am going to show you by video how to work the 24-strand Palma braid as I was taught in Peru by a sling braider. 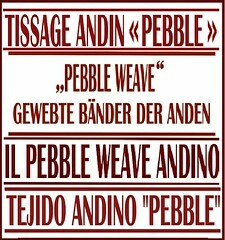 The fiber used in the sling braids is generally llama and the strands are fairly thick and, therefore, easy to manage in the hands. I don’t imagine it would be quite so easy with fine yarns. You can also see the strand order in the photo at left. 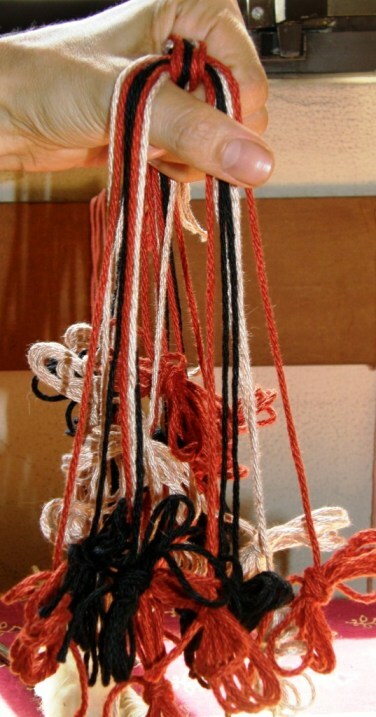 Once you are braiding, only two sets of strands are worked together at any one time. 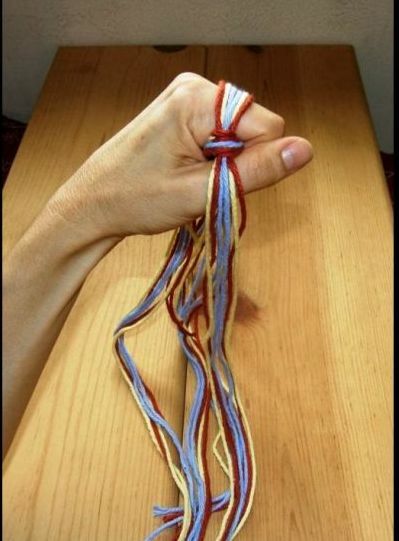 You work with the near and far side sets while the other two sets are hidden in your fist, clasped against the braid itself as you can see in the photo below. Well, I hope these video instructions were clear for you.Remember that yellows always pair with reds and vice versa and that you are always working from left to right across the strands. In your very first two moves, you won’t need to think about “uppers” and “lowers” when you work with the blues – just grab any blue and cross it over. Uppers and lowers will become apparent after that. Tug lightly on each strand before you cross it. The picture at left shows how my teacher held the strands while braiding. All the ends were wound into butterflies and his hand was tilted so the strands all hung down. It looks like a mess and the strands occasionally wrap around each other, but it works! Strands are going this way and that and then you open your fingers to reveal this gorgeous braid. 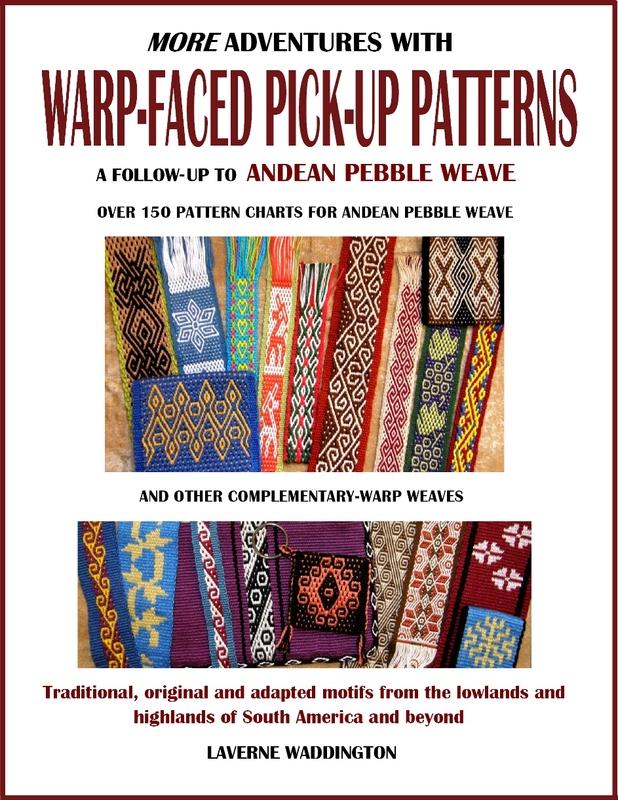 Here are the instructions for weaving the Margarita braid as taught to me by my sling braiding teacher, Zacarias in Yanque, Peru. If you have watched the video I made on the Palma braid above, you will be familiar with what I mean by “near side”, “far side”, “uppers” and “lowers”. 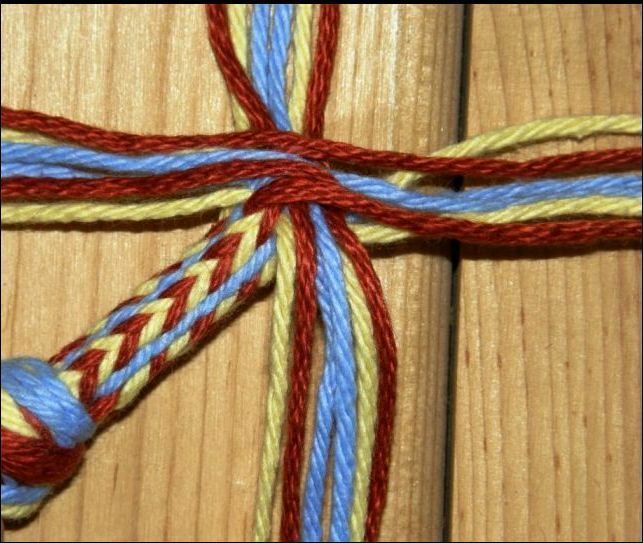 You will have seen how the braid is held in the fist, how a warp is passed from one side and paired with a warp from the other side and anchored and how the entire braid is rotated once a part of the sequence is completed. So all I need to tell you now is the number of strands, their color arrangement and the parts of the sequence. Remember that lowers always pass over to pair with uppers. Black near side to red far side. Black far side to red near side. Red near side to black far side. Red far side to black near side. Part two: Start at black far side. Part three: Start at red near side. Part four: Start at red far side. 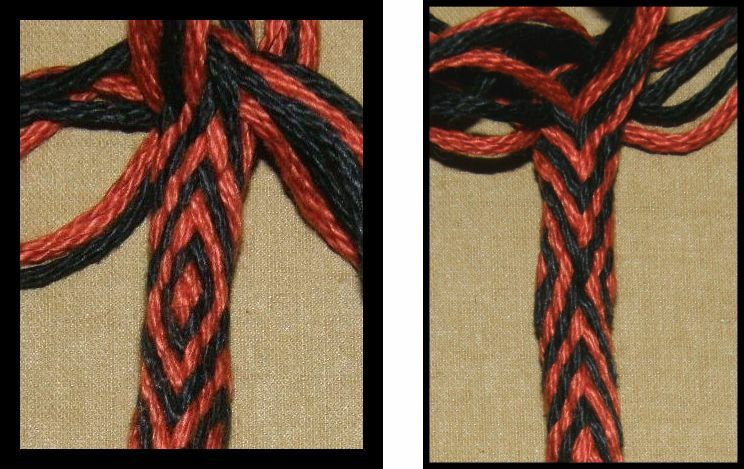 If you continue like this, you will be making“V”s on two opposing “sides” of the braid and inverted “V” s on the other two sides. 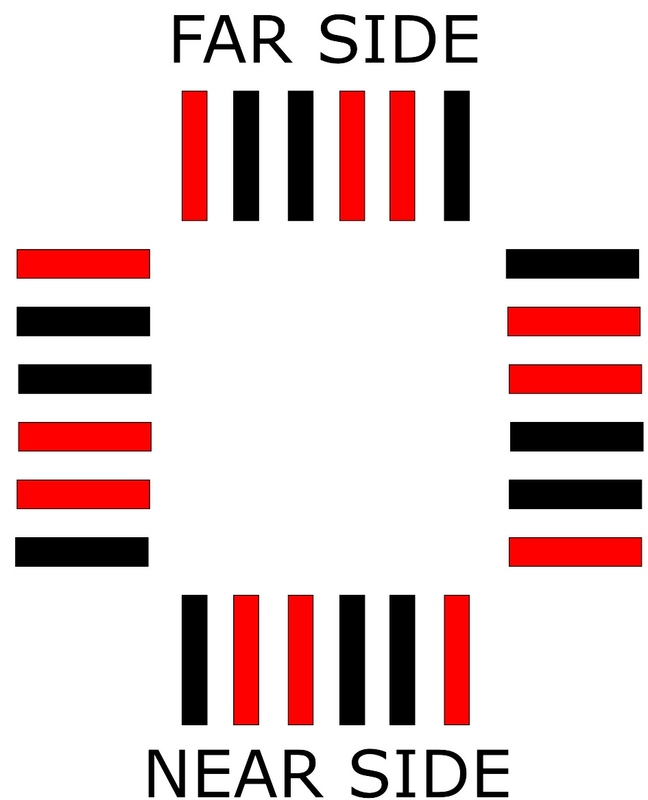 If you reverse the parts of the sequence, the “V“s will invert to first form a diamond. The inverted “V”s will flip to form an“X”. In the photo at left you can see the diamond on the left and the “X” on the right. To create a black diamond with a red center, stop when you finish part two of the sequence. Instead of proceeding to part three, do part four. Now the sequence will reverse. You will proceed with parts three, then two, then one. Thank you! I am holding onto the picture of your latest sling and can post it together with the link to this vid next week. I’ll watch the vid tomorrow…internet is being a pain tonight. Hi Laverne, just a quick note to let you know the 2 Palma braid videos are not showing. I think there may be some others too, will look around later, no time right now. I’m still thinking about the last workshop, how fun it was, and slowly beginning to understand the moves we did for the doubleweave patterning! Hope your workshops and travels are going well! Thanks Ingrid. 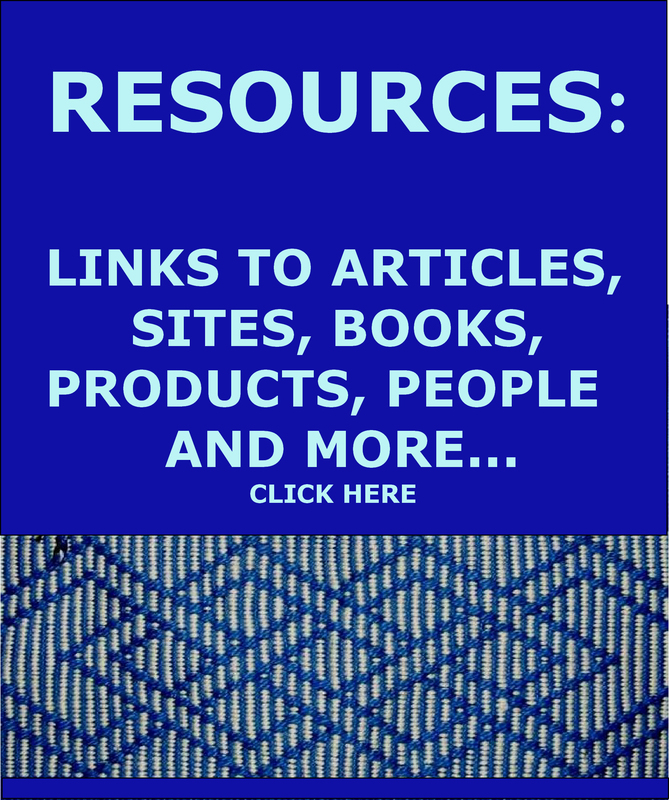 I just logged out of my blog and went to my pages as a visitor rather than admin and I can see those palma braid videos just fine so I am not sure what the problem is at your end. However, I really appreciate your taking the time to write to me about this possible problem. I am gals you are thinking about the double weave. It is a good idea to weave it and reinforce what we all did together as soon as you can after the workshop. I just finished my last class and will head home this week after a visit to the Textile Museum. Thanks a ton! I’m trying to learn some techniques for my slings and this post is most helpful! Great tutorials Laverne. It may be a while before I give these a try but before you come back to Vermont I’ll see what I can do…then I’ll have to find a way to use them around the house. The first one looks very strong, I could use it as a handle for my banjo case.The Margarita braid would make a nice round strap for my mandolin. I’d better get busy! 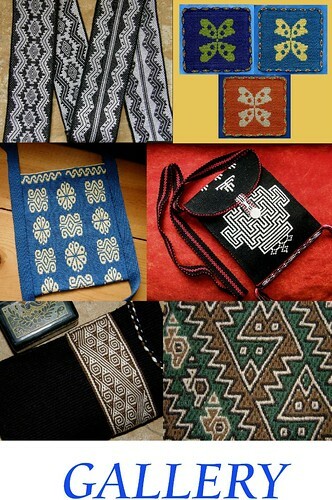 Do you have any idea how braiders traditionally remember these patterns? The only way I can get these right is to use a row counter together with the pattern. I need to label the near and far sides when I stop. Surely, this isn’t how the experts do it. I can’t make sense of how you know you’re starting with near to far not far to near on a row. Amy, I wonder how many times you have made one of these braids and I wonder how many times the Peruvian braiders have done so. It comes with experience so don’t get frustrated and expect too much of yourself too soon. 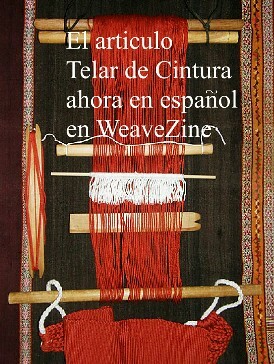 It comes with looking at what the threads are doing on the braid itself rather than just following the steps blindly. You can start by seeing which color looks like it should be next and then you can tell which from whether it is the upper or lower of the pair as lowers always cross to unite with an upper. 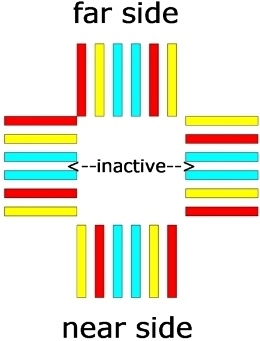 In might help in the Palma braid if you think of the threads as uppers and lowers rather than reds and yellows. I do think I’m starting to make sense of the Margarita It’s lowers to uppers in the matching pairs of one dark and one light. If you end a side on near to far, you start the next one near to far. If you end a side on far to near, you start the next one far to near. The trick is that starting near to far makes everything slant one way and starting far to near makes it slant the other. This is all you need to remember except for the eyes. You do an eye by starting the wrong way on a row (near to far when it should be far to near or vice versa). I’m still trying to figure out how you know when to do that. Ok, I’ve figured out the reverses now. If you’re making red eyes, you reverse when your last set of passes started and ended with crossing black and your next set will start with crossing red. You switch which side you start the red on. You still have to watch carefully to make sure you aren’t doing this a row too soon or two late (adding extra Vs or upside down Vs). I don’t know if this is of any use to any one else, but I’ve been keeping my place by tying a loose overhand knot in the far set of strands when I stop. Then I tie a loose overhand knot between the far and near sets of strands. I’m still trying to decide if I really need to know which was near and which was far.